The Lord's Lass: Blessings of a Bloggy Birthday! Blessings of a Bloggy Birthday! Hello, friends! Come in! So glad you could make it! As you can see, I've spruced up the place for all the rare fun that's to happen this week. Scrubbed the windows, dusted the cobwebs, put up some new paint ~ how do you like it? Pull up a chair, will you? 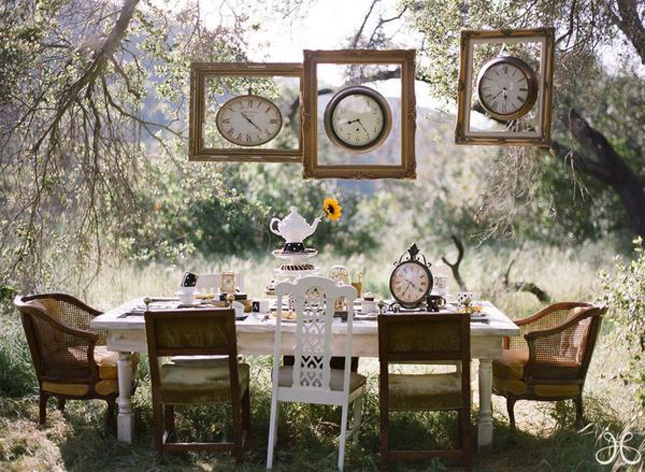 Would you like some tea? How about some cake? Yes, yes, that's two candles ~ can you believe how old my little blog is growing? As I look back over these last two years of blogging, I am overwhelmed (and grateful) for the BLESSINGS documented herein. There have been the blessings of memories, lessons, miracles, and musings. Blessings of adventures, smiles, stories, and amazement. And, of course, there has been YOU! Whether you're a bloggy friend, internet acquaintance, or a friend I run into in everyday life (sorry about that ~ I'll have to better watch where I'm going! ), I want you to know that your comments put a smile on my face and give me a day of sunshine! Yesterday, I had the privilege of attending some friends' church, and there I heard a beautiful truth which seems to me to perfectly define true blessing. "We do not," the pastor challenged, "come to God to get what we want, but rather what He has to give us." While I am quicker to label the gifts listed in the paragraph above as "blessings," I have learned - and am continuing to learn - that when we receive tenacity to withstand pressure, comfort to carry through grief, or ability to overcome incompetency, these are often the most rewarding of blessings. In this last year I have begun to learn that somehow, God, in the miracle of Who He is, creates the most perfect beauty out of the most hopeless circumstances. It is the nature of our God. Is He not beautiful? Is He not awesome? Is He not deserving of every form of worship? As you munch on delicious chocolate-covered strawberries at my little bloggy-birthday party, I ask that you would meditate, would remember, would share with me the blessings ~ both the easy and the hard ~ that Christ has given you this year. Surely, as Christians, there is no greater encouragement than to hear the stories of the Saviour's work! 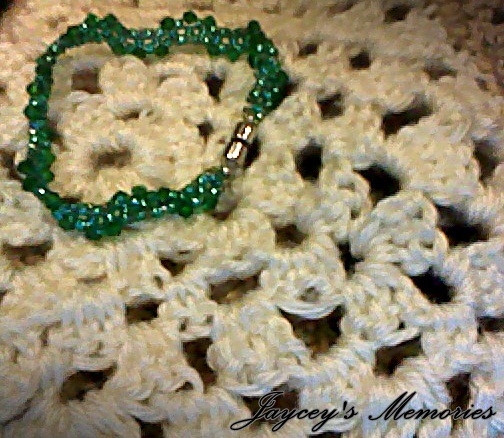 The first lovely is this wonderful "Emerald of the Sea" bracelet, hand-made by none other than my own amazing Grandma! 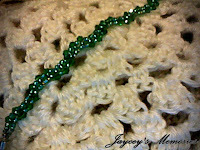 An elegant, deep green, beaded in a wave pattern, it is one of my favorite jewelry pieces Grandma has made (definitely makes me think "Ireland" :). Next item up for the give-away is C.S. Lewis' Till We Have Faces. 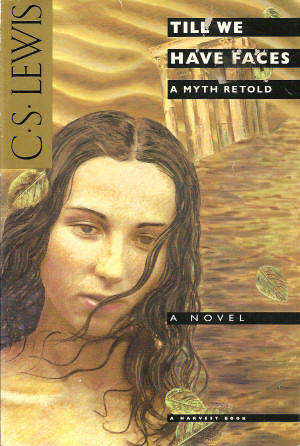 I know that I've said this about nearly all his books, but this is my favorite work by C.S. Lewis. In his personal retelling of the mythological story of the goddess Psych, Lewis inexplicably grew my awe, fear, and love of the one true God. One of my top recommended books, to be sure! Are you as excited about these as I am?? Thought so! Here's how you can enter for your chance to win one of them! Please leave one comment per entry you receive on this post. Give-away is open to both U.S. and international bloggers. :) Ends 11:59PM, March 18th, Pacific Time. Now please, have another slice of cake and enjoy the party! Blessings! Looks lovely over here! I love the open-book header! I'm going to have to enter for the book, because, well, you know me and books! And, sadly, I haven't read that one yet, but I see that I am going to have to! Happy blog birthday--I've been so encouraged by reading all you post here! Hey Sarah, Happy Blogger-Birthday! I'd like to enter for the bracelet. Love you! Thanks for inviting me to your party via Bronwyn. I have never read a single CS Lewis book so I don't have a clue about his depth. I sruggle with allegorical stories in much the same way math story problems can take me hours to complete. There are so many ways to look at the things that seem to be so obvious in our lives. For example, Alice has 8 apples and considers a serving 1/2 apple per person. How many can she feed? I don't know. I need more information. How will she serve them? Will she make applesauce and just divide it equally among however many are present? Or will she bake a (gluten free) pie knowing 3 people won't eat refined sugar? OR has she asked the Lord to bless her abundance so she can be like the boy with the bread basket and serve all who are hungry? That being said...can I tell you how much I have appreciated watching you and your friends grow into Godly young women? You are so RICHLY blessed to have the spiritual heritage you have in your parents and grandparents. I love that you enter His Plan as His Servants unhindered by "baggage." Happy Birthday! The treats are delicious! Maybe I'll just take one more piece of fudge. I would like to enter for the bracelet. By the way, I love your new decor. Am I the only one who voted for Red? I am so curious as to what he would write. Hmmm...I thought I had left comments twice before but I only see once. So. maybe that means I am disqualified from the book drawing.